The Rhone region is known chiefly for its Northern Syrah varietal wines (see related article: ‘Shiraz’) whilst the Southern Rhine is known for its blended wines such as ‘Chateauneuf du Pape’. 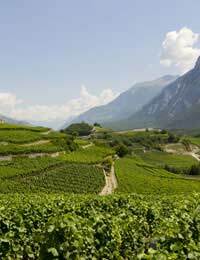 Rhone wines are grown in the ‘Rhone Valley’ that is carved out by the Rhone River. A good climate with steep hillsides contributes to an ideal wine growing terrain. The most sought after Rhone wines are the Hermitage Reds – invariably rich and full bodied Syrah’s. In the North the only red grape legally allowed to be grown is Syrah. In the South there are many more different varieties grown, with as many as 13 qualifying for inclusion in Chateauneuf du Pape, though principally from the fruity/spicy Grenache. Of the 13 grapes used some are white: Often all the grapes allowed are used in a final wine, though some in very small quantities. Red wines from both the North and South are full bodied and power driven, with Syrah being slightly more tannic and spicy than its blended Southern neighbour. Although Rhone Syrah may only contain Red Syrah grapes, it can contain a small amount of white grapes. White wines are also made in Condrieu and Chateau Grillet, but containing only Viognier. The Northern Rhone really is one of the strictest adherence to purity there is, and that is saying a lot in a country dedicated to wine bureaucracy. Southern whites are usually a blend of several white grapes, often also from the Chateauneuf du Pape region. Wines from the Rhone region are generally categorised under a local appellation, such as ‘Croze-Hermitage AOC’ in the North, or ‘Gigondas’ AOC in the South, although ‘Cotes de Rhone’ is applied if the wine is not from a recognised specific appellation area. Wines from the Rhone region tend to be between 12 and 15% vol. making them one of the typically strongest wines in France. Red Chateuaneuf du Pape is said to go very well with Casseroles, Lamb, Chicken and Cassoulet. White Chateauneuf du Pape goes well with Chicken, Duck, Turkey and Game. Try Chateauneuf du Pape with Roquefort, St Marcellin, Langres and Maroilles. Of these cheeses the second, St Marcellin is specific to the Rhone region. Its creamy texture goes well with a bold Red Rhone wine. The ‘Chateau du Beaucatel 2004 Chateauneuf du Pape’ is said to be exemplary, with a deep red colour, strong but subtle tannin content and flavours of fruit, smoke and Cocoa. The 1999 and 1997 wines from the same Chateau are said to be also very good. The cheaper ‘Caves Saint Pierre Cotes du RhoneVillages’ wine is cheaper (£5 to £7 and available at the supermarket). A southern Grenache produced from the harvests of selected villages, it is a good introduction to wines of the region. For a Syrah try a ‘2004 Crozes-Hermitage, Les Meysonniers Michel Chapoutier’, which at £10-£12 is about as cheap as you’ll get a good Rhone Syrah (and Californian style Syrah’s are often even more costly). Lively tastes of plums and spices mark this as a good example of the grape and region.